Are you thinking about having your van signwritten, but don't know where to start? Why not give us a call or pop in for an informal no obligation chat. We will sit with you and guide you through the process from initial idea to completion. We offer a Full Graphic Design Service including company logo design. We will fit in to your busy work schedule, including providing a design and fitting service on the weekends, so that it doesn't interfere with you busy working week (by prior appointmant only). You can even drop your vehicle off on Friday evening and collect it on Monday morning complete with your new sign writing. Our yard is completly secure and is covered by Monitored CCTV 24 hours a day, 7 days a week, 365 Days a year. Come and have a chat, so that we can get your ideas from scribbles on a piece paper, or an idea in your head, to a quality finish on your vehicle. We only use quality 7 year vinyl on our vans and sign boards. All of our full colour digitally printed and contour cut graphics which are produced here on site are laminated. This helps to protect the design from damage and fading. A sign written van starts to sell your business services as soon as the vinyl is applied and keeps selling 24/7 - 365 days a year and a busy van could be seen 1000''s of times a day, getting your business out there and getting 'YOU' noticed. Established in 2001, we have many years experience in vehicle graphics, design and application. We can also supply vinyl to you pre-cut and spaced ready for you to fit yourself (see our DIY Vehicle kits page). 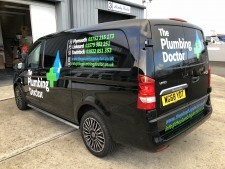 We have invested heavily in new equipement and can now supply top quality full colour graphics, which can be used to fully wrap a van as on SOUPY DO or mixed and matched as shown on THE PLUMBING DOCTOR and SRS BLASTING.